I love going to Palestine because it's a very different country, owing to its unique circumstances. An occupied land, its fate controlled by the Israelis, it has paradoxically avoided certain ills that many developing countries have fallen upon. This is hinted at by this quote from a 1990s BBC war correspondent, Martin Bell, who covered the fall of the Berlin Wall and the Bosnia war: "Peace and freedom can be defined as the peace that makes traffic jams possible and the freedom to sit in them". Military occupation has given Palestinians a few gifts. One is a friendly and very human society - hospitality, sharing and generosity are notable here, and foreign visitors are frequently deeply stirred by this. Another is attitude: Palestinians have faced stuff others avoid, and they've come out the wiser for it. This is indeed a Holy Land: there's something in the energy of the land, its 'place memory' and its inspiring and tragic history which makes it special, whether or not you're a believer in any of the three faiths rooted here. There's something very alive about this land. There's something else too. You notice it when you cross the separation wall from Israel into the West Bank. If you compare Palestine with its neighbour, Jordan is more of an economy while Palestine is more of a society. In our day, when globalisation and corporatisation have extended their tentacles across the globe, this is rare, to be a society in the way Palestine is. While Israel has won the conflict militarily, arguably the Palestinians have won it socially and spiritually. There's something about the unknowns that Palestinians face. Palestinians still have no clear idea about their future prospects, since these are in the hands of their Israeli occupiers and the international community. This insecurity creates a spiritual and human edge which makes the Palestinians one of the more awakened societies on Earth. Not that life is at all easy. Some suffer poverty, disadvantage and hopelessness but all Palestinians, whatever their status, have their rights denied as humans and as a society, as a result of the occupation. This makes life in Palestine very challenging. Other countries can be challenging too, but this is a different kind of challenge - a national imprisonment. The West Bank landscape is impressive - elevated highlands of limestone 700-800m (2,000-3,000ft) up, with deep valleys, villages, mosques and churches perched on hilltops or spilling down the sides of hills, with ancient agricultural terracing, olive trees, wide vistas and sweeps of scenery. Palestine's towns, some of which go back millennia, have old historic centres with characterful alleyways, souks, nooks and crannies. The harmony between Palestinian Muslims and Christians is noteworthy. About 30% of the nation is secular too (though in these days of Islamism, many of them keep their heads down). There's hardly any crime - except the crime of a military occupation and the apartheid it brings. There's some corruption and nepotism at the top of Palestinian society too, exploiting the vast sums that come into the country as aid and development funding (guilt money), and the power that control of it gives to those with a foot in the door. But the majority of Palestinians are very honest and high in integrity, an example to us all. This is not a place for camera-snapping consumer tourism. The locals invite you to open up, visit their families, hear their stories and join in their lives. These people are heartened by the visits of empathetic strangers. That's why, to anyone with a human heart and a yen for something different, Palestine is special. It's well worth a visit. If you don't want to visit, it's still worth keeping this brave people, the Palestinians, in your prayers. 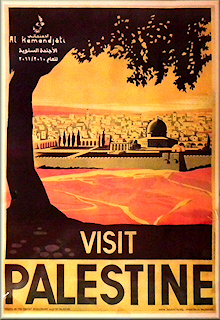 Palestine is a living country, with plenty of fine people and interesting and special places. Each day can be filled with events and experiences, some touching, some heart-wrenching. Life is not boring and routine. The openness of the people makes a big difference. They call on you and me to respond with openness and directness, with an emotional intelligence which, in my own country of Britain, tends to be withheld and reduced to comfortable margins. Even walking around the streets can be quite engaging. A kid comes up to you and starts talking. An old lady makes eye-contact which communicates to your soul. Even when complaining about their lives, there's something vivid in the way Palestinians treat life. But it's not just people: there's something scintillating in the land too, though it is quite densely populated and, in parts, ruined by scenic atrocities such as the separation wall, army watchtowers and plenty of bulldozed land. The holiness of this Holy Land manifests in the strangest of ways, in sharp-edged paradoxes and contradictions which completely fail to respond to logical understanding. Moments can oscillate from the best to the worst, yet it's colourful and rich with human and spiritual issues. This is very stimulating. It brings us to consider life's deeper issues and principles, and to clarify what we really feel about life. The poorest of people can be so generous. The least educated can be astute and perceptive. A manager can be humane and spend time drinking coffee with you. A child can be one of the most mature people around. I encourage you to consider visiting. Just walk the streets and relate to people. Be served hummus and tabouleh in a cafe. Go visit the tomb of Abraham or a marketplace anywhere. Pray for the world in a holy place. Let the human in you come out. It could be the trip of a lifetime. It's safe in Palestine, contrary to expectation - a woman can walk alone through the streets. There's a low-level conflict going on, and unpleasant scenes. But strangely, it's this which adds the edge to being in Palestine. It makes us aware of what justice truly could be. Palestine is a microcosm of the world. What happens here is relevant worldwide.